For conservation trusts, land trusts, municipalities and other land and trail management organizations that want to manage their website in a modern Content Management System with in-built abilities to organize and present information about lands and trails, Trail Websites’ Trail Data Manager™ can save significant time and money. Trail Data Manager™ is the toolkit we use to rapidly build websites for our clients. Trail Data Manager™ extends WordPress to manage conservation holdings, trails and land stewards. You can use Trail Data Manager™ to maintain a database of your land and trails with maps, photos, GPS trailhead coordinates, descriptions, cautions, feature lists and more. Using shortcodes for WordPress, you can present an overview table, detailed trail pages and a navigation list of trails in your WordPress powered website. You can even present a downloadable PDF trail guide generated from the same data. 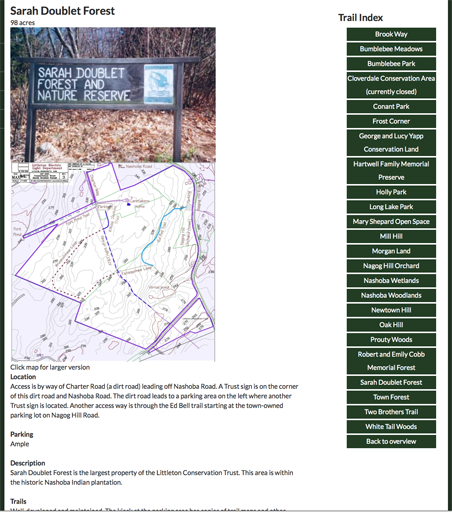 Trail Data Manager™ is in use by multiple conservation trusts and was originally developed as a custom project for Littleton Conservation Trust in Littleton, Massachusetts. Trail Data Manager™ is available immediately as part of website design and development projects we deliver. 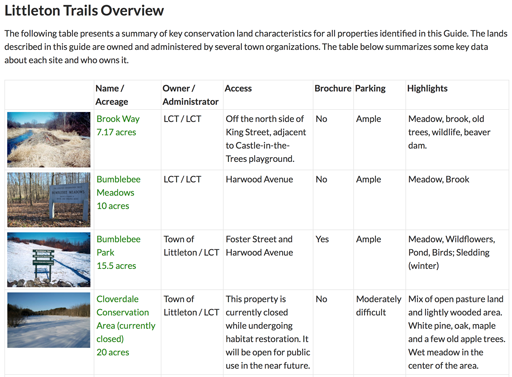 Land and conservation trusts from Virginia to New England are now benefiting from Trail Data Manager. Browse these images to get an idea of how Trail Data Manager™ works.